As an entrepreneur or business owner, there’s a good chance that you just don’t value your time –at least not enough. Have you double-booked yourself for an appointment or forgotten about one completely? Do you often stress about your business, wondering when the work will ever end? If you can answer yes to any (or all!)) of the above, then keep reading. In this article we’re going to uncover some essential time management skills that every entrepreneur should have. Don’t worry –the great thing about these traits is that they’re skills –things that you can learn and improve upon over time. For every entrepreneur, the challenge is always to work smarter, not harder; to use your time efficiently and effectively. In this article, we are going to go over a few traits that can help you to make the most of your day. There’s also a ton of tools and resources out there that can help to boost your productivity and increase your output –which we’ll outline, and touch on for you. So clear your calendar and put your chat on snooze. It’s time to spend a little time to see how you can get a significant amount of time back! First up, the most obvious skill: organization. Being able to get organized is a key skill that every entrepreneur must have. Unfortunately, though, it’s also something that many of us struggle with. This is often because when it comes to getting organized, we completely miss the point. We think being organized is about having everything jotted down in little slots or put back into the right spot, when really, it’s about finding a system for ranking what matters most, and what should come secondary. The ability to prioritize is pivotal –a key part of successful organization. A little organization goes a long way. When you were first starting as an entrepreneur, it was probably relatively easy to keep all of your tasks in your head. However as your business expands and responsibilities grow, you’ll soon find that some things start to fall to the wayside. While there is much to be said about organization, one tool that can help tremendously is project management software. Contrary to popular belief, you don’t need projects, specifically, to use this software. Say, for example, you are a freelancer with three clients, and also volunteer for a non-profit. You can set up each of these gigs as a ‘project,’ as well as any other obligations in your personal life. These tools can be extremely flexible and are only limited to your imagination. There are several project management applications out there today, but two of the most popular are Trello and Asana. Each one has its benefits and drawbacks and the best option for you will depend largely on the size and complexity of your organization. Trello is a free project management application that has a clean interface, is easy to use and perfect for small to medium-sized businesses. It’s drag and drop tiles system makes it easy to organize your projects into tasks and priorities. 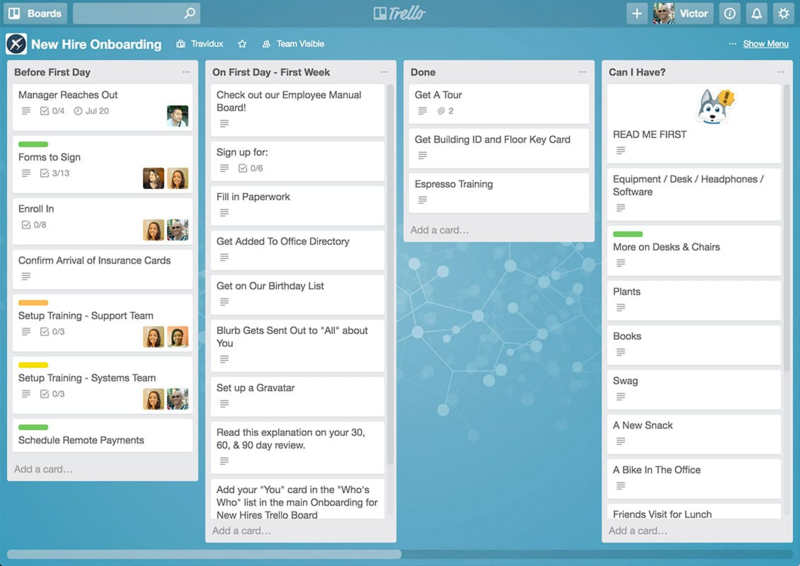 Trello’s drag and drop tiles make for a simple, clean user experience. 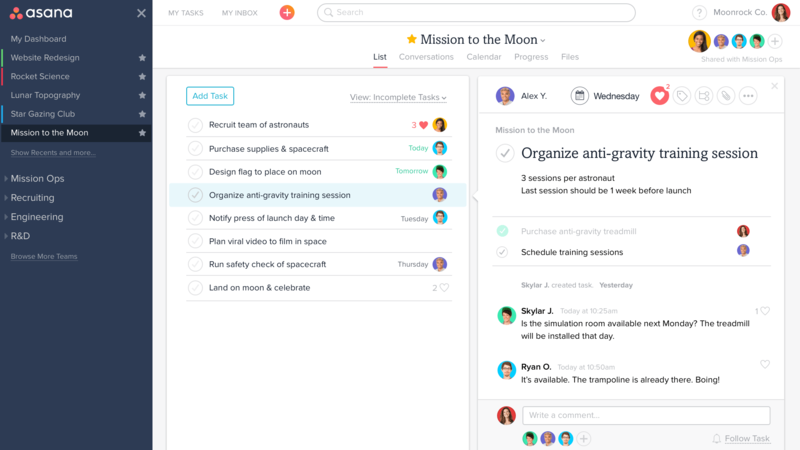 Asana is free, but also upgradable if you are going to be building out a team. This platform is also excellent for small teams but shines when scaled up to medium and larger organizations. It is a perfect tool to keep you and your team on the same page. 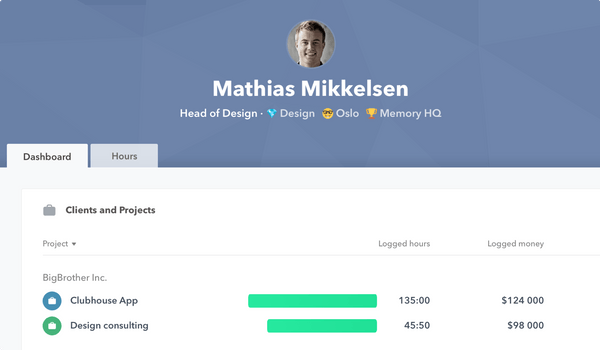 Asana’s dashboard is clean and efficient with a clear delegation of roles and tasks. The best thing about both of these time management applications is they integrate with time tracking apps like Toggl and Timely. For a deeper comparison between Asana and Toggle, checkout this post from Slant. These tools will help you become the pantheon of efficiency that you strive so hard to be. As amazing as automation is these days, it still isn’t enough to allow you to run everything on your own. Even though you may be a jack of trades, if you’re constantly doing it all yourself, then there’s a good chance that you’ll end up master of none. Don’t take it personally, we as humans only have so much time in a day and so much bandwidth. Your role as owner/operator/entrepreneur should be that of delegator-in-chief. You need to find the very best personnel for a given position and fill it. You can free up a ton of your time by hiring freelancers or virtual assistants, or an agency to take on tasks that are not necessarily mission critical. For example, if you run an e-commerce business, and don’t have top-notch technical skills, why not hire someone to do it? The advantages of hiring an agency to run your digital marketing are numerous. You are essentially offloading a ton of your strategic and tactical responsibility to someone else. A professional in their given trade? Even better! An oft-overlooked avenue for outsourcing is hiring a virtual assistant. Most people are surprised by the amount of work that can be farmed out to a virtual assistant for a fraction of the cost of hiring in-house. Marketing, customer service, finance, and administrative tasks can all be handled these days by a qualified VA. And if you go through a VA agency, you can seamlessly scale your business operations, as you’ll be able to offload more tasks as you grow. Before you delegate, though, it’s important to ask yourself if the task in question is something that can be automated. Automation obviously isn’t ideal for every task, but if it fits the task in question, then you’ll want to opt for automation over delegation –or in addition to delegation. Most tasks that are long or repetitive can be automated –at least partially. As an entrepreneur, this should conjure up a rather large list. Take social media management –it’s a task that can be automated as well as outsourced. There are some great tools out there for managing social profiles today. Two of the most popular are Buffer and Hootsuite. These apps allow you to schedule your social media posts to go out at ideal times –saving you from having to manually sign in and post the content yourself. They’ll even go as far as suggest content for you to post, based on pre-set keywords. 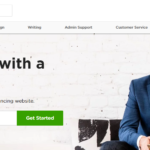 This, of course, can be a great time-saving tool, and something you’ll want to think about using EVEN if you’re planning to outsource your social media marketing to a VA. Why? Simple. By reducing the amount of work and time that’s required, you’ll be able to reduce your VA’s workload as well, saving you money. 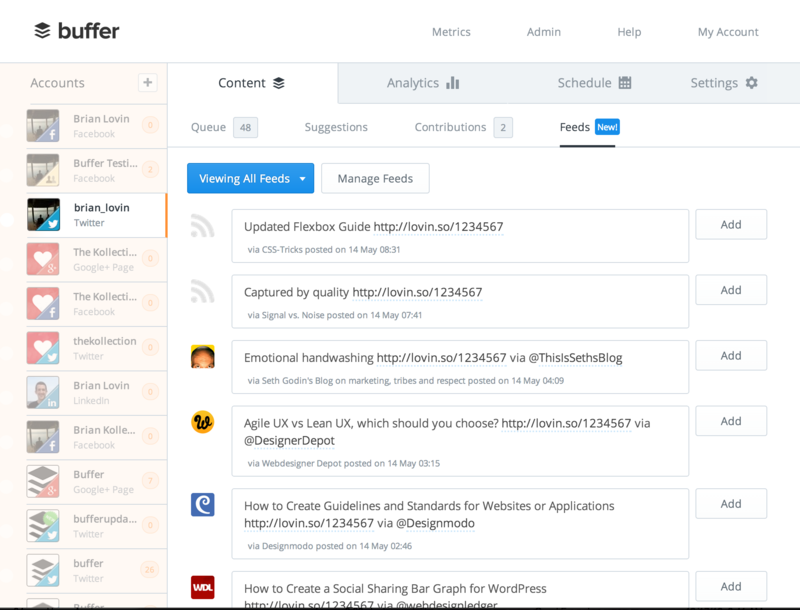 As such, it’s a good idea to reduce any given task to its simplest form –via automation or simplification, before outsourcing to a VA.
Buffer’s interface allows you to follow RSS feeds and add suggested content directly into your posting schedule. Or what about going paperless? Sure it may seem scary at first, but if you set up your system correctly, it can be a real time saver. Invoices, receipts, and bank deposits can be easily managed online. For example scan receipts with the Evernote app, automatically apply the #tax tag, and boom, you just got a nice file of your deductions for the year to give to your accountant! It may seem like a no-brainer, but one of your best tools for creating more space for yourself is the good old-fashioned calendar. This tool, if used effectively, will allow you to understand your time from the 10,000-foot level. Instead of reacting to things throughout the day, and becoming worn down, you’ll feel calm and in control. Your calendar should be something you use consistently –and strategically. It shouldn’t just be a place to jot down random events; instead you should use it as a tool to map out your long-term plans and goals. It’s also important to schedule in free time as well. Take a few blocks of time each week to do nothing. It will relieve your brain of having to remember tasks and small details. Instead, it will be free to solve problems, be creative, and be present with others in the moment. Being on top of your schedule is paramount, but be sure to build in buffer times between appointments as well. Travel time, preparation time, and follow-up time all add up and can catch you by surprise. Also, make it a point not to overschedule yourself. Yes, it is tempting to be that classic entrepreneur that burns the candle on both ends, but that isn’t going to get you across the finish line in one piece. Make sure you schedule in enough time for yourself and resist the urge to overcommit. 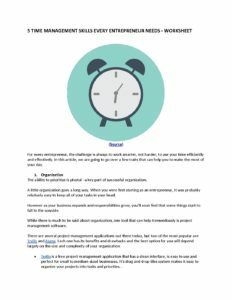 Get our 5 Time Management Skills Every Entrepreneur Needs Worksheet delivered right to your inbox. Another key skill is introspection. It’s vitally important to be able to take stock of your situation from time to time, to understand the scope of your role and to analyze whether things are going according to plan. What are your long-term goals? Have you set benchmarks? What does success look like to you? Are you doing enough to make your goals happen? Are you spending your time on things that matter; tasks that will help you to reach your goals? When you’re going through the motions every day, and jumping from problem to problem, remember to take some time for yourself and reflect on what it means to be in your role. Ask yourself how you can improve –and be open to change. This isn’t about berating yourself or getting down about any shortcomings or lack of progress in certain areas, instead, it’s about goal-setting, creating plans, and keeping yourself on-track and accountable as you work towards your big-picture goals. Finally, discipline is another important skill, but it can be a tough one for some. 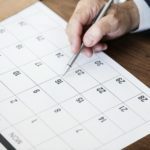 Creating a routine every day is something that works for many, as it helps to remove guesswork from the equation, and can assist in making you more efficient. Tim Ferris, podcaster and author of The 4-Hour Workweek is famous for his insistence on creating a custom-made morning routine. It can truly set the pace for the rest of your day. Another tip that experts often recommend is avoiding email for the first hour of work. This is because when you begin your day with an email you’re immediately in “response mode.” Doing so makes it too easy to go down a rabbit hole of answering email. Next thing you know, you’ve lost half the day, and you haven’t addressed anything. You’ve spent the morning being re-active, instead of pro-active. Instead, check your schedule, take some notes and think about your strategy for the day. If you’re a fan of systems and processes, this tip is going to be a home-run! There are a ton of applications out there today that can not only help you track your time, but also keep you focused on one task at a time. Managing your own individual time is much different than that of employees and staff. Understanding how to manage one’s time effectively is a skill that is acquired step by step, and like all good habits, it must be practiced regularly in order for it to stick. Before you’re able to make any changes, you need to understand where all of your time is going and attempt to slow down the leakage a bit in the meantime. Timely by timely app is time tracking solution that allows you to keep track of every minute of every day. It is web-based, but also offers native apps for desktop, Android and iOS that sync together in real time. This provides an ideal solution for those that can’t seem to figure out where all their time is going. You simply set your task, click the button and boom! Your time is being tracked throughout the day. Just be sure to organize your tasks, the data you get out of this is only as good as the data you put in. 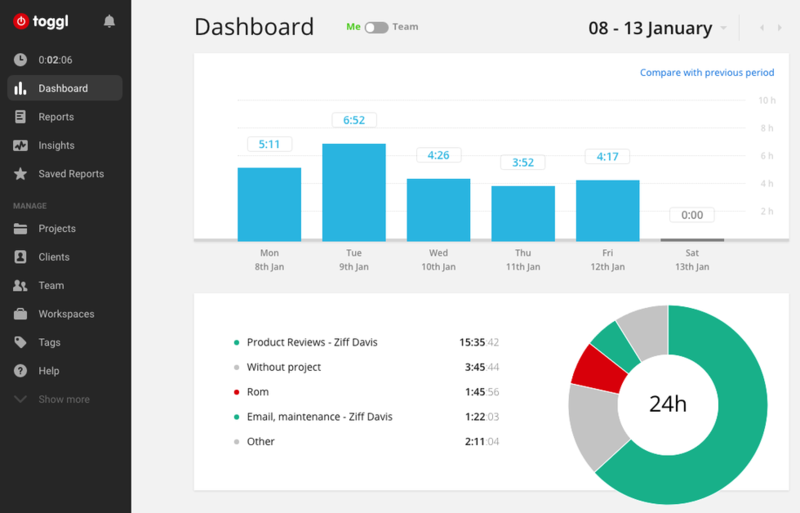 One of our favorites, Toggl is an excellent tool for freelancers looking to track billable time for clients. However, beyond that, Toggl can be very handy for tracking your time throughout the day. You can designate task by project or category, making organization much easier. Download the iPhone or Android app, and also the Chrome extension for max tracking. Focus Booster is a hybrid between Timely and Toggl, and the Pomodoro method. 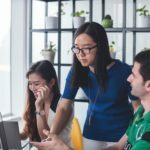 For those that don’t know, the Pomodoro method is a time management technique that has you work in 25-minute segments. It is a great way to stay focused on one task. The cool thing about focus booster is it has a standalone desktop app, and also Android and iOS apps that sync together. You are able to track, and categorize your time, which sort of kills two birds with one stone! Each of these tools performs a specific task that will enable you to either track your time, eliminate wasted time, or work more efficiently. 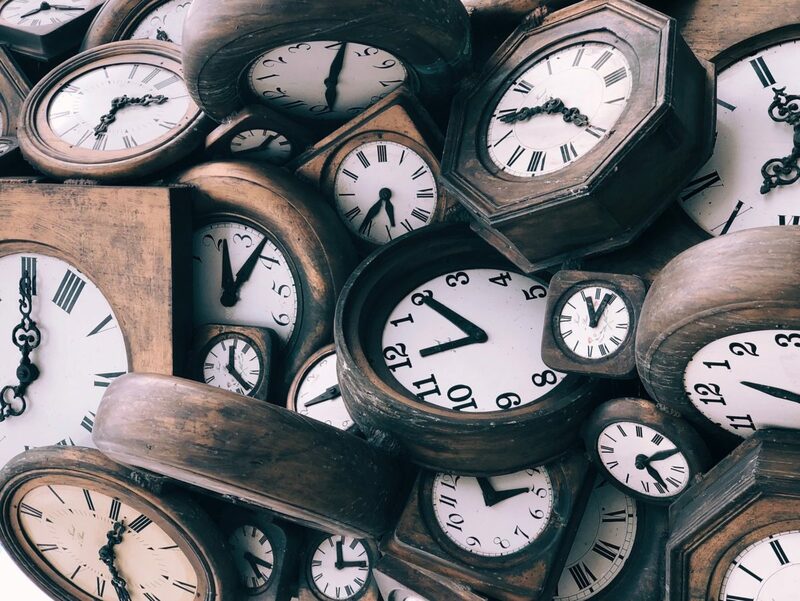 As an entrepreneur, your most valuable resource is time –it’s also the one thing that’s always in short supply –so make sure you’re using yours effectively. The above tips can help you to ensure that you’re on track to claim back more of your day, allowing you to focus more on those things that matter the most. What time-management tips do YOU recommend? 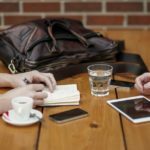 When Is It Time to Delegate Tasks?